Thank you for your insight! And wishing everyone the best of luck going into this admissions cycle! Re: Chances for Current Harvard Grad Student? Chances aren't very good. I'd apply to every T14 except HYS, because you could get some considerable money at other exceptional school. If you have the extra $ and want to go for it, then feel free to submit HYS apps. Someone got into S in your LSAT and GPA range. The sample size is low, so it's hard to tell what's going on at the HYS level. RedPurpleBlue wrote: Chances aren't very good. I'd apply to every T14 except HYS, because you could get some considerable money at other exceptional school. If you have the extra $ and want to go for it, then feel free to submit HYS apps. Someone got into S in your LSAT and GPA range. The sample size is low, so it's hard to tell what's going on at the HYS level. I don’t agree. URM cycles are unique. There is no reason not to apply to HYS. Who knows maybe OP can get fee waivers. If you can, retake the LSATs and get a better score. We advise everyone to do that and there is no reason for you not to do so. You have room to improve and retaking should be a definite option here. Are you certain you need a law degree for the career you want? Is the current Masters enough? URMs have unique cycles to the extent that they can drastically outperform non-URMs with the same statistics or perform relatively similarly. Even if you put OP in the dramatically outperform crowd, OP isn't getting into HYS with a 3.5 and 168. Even URMs have ceilings. Realistically, OP is going to need to hit 170 or 172 to have a shot at Harvard and probably higher for Yale or Stanford to come into play. 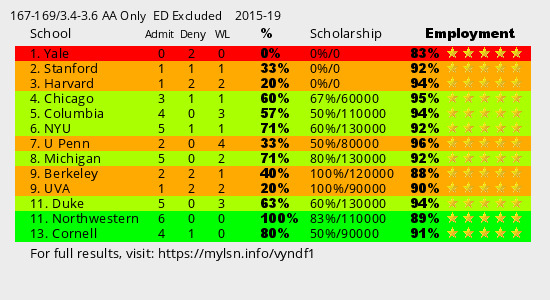 I've done probably 20 permutations of OPs GPA band and hypothetical LSATs and none of them look particularly rosy for HYS. I know it's pretty blind dogma around these parts that "URMs should apply everywhere because they have crazy cycles," but at some point you have to be realistic. Like I said in my original post, if OP has the extra money, there's no harm. Otherwise, if OP doesn't and also doesn't get a fee waiver, I wouldn't apply. The reason I say to apply is that the data is too limited to make reliable predictions. That’s why I would never say don’t apply even with these numbers. I appreciate your take on URM cycles. I think OP can retake and with a few points have a better shot. Can I ask you something? Are you first-gen? I have a hunch that first-gen designation helps in addition to URM, so would be interested to know that. Keep us updated on what happens! Best of luck! URMs have unique cycles to the extent that they can drastically outperform non-URMs with the same statistics or perform relatively similarly. Even if you put OP in the dramatically outperform crowd, OP isn't getting into HYS with a 3.5 and 168. Even URMs have ceilings. Realistically, OP is going to need to hit 170 or 172 to have a shot at Harvard and probably higher for Yale or Stanford to come into play.